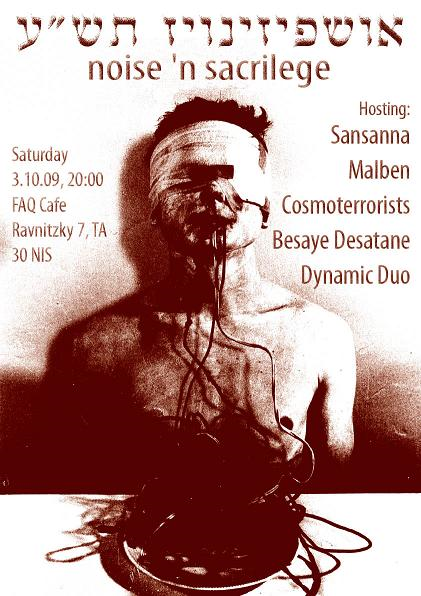 We’re having yet another quality noise event at the Ravnitzky in Tel Aviv this weekend! It’s the first ever Ushpizinoize Festival, a celebration of sacrilege and noise – A blasphemous homage to this ancient Jewish tradition of inviting “spiritual guests” to the sukkah on the seven days of the Sukot holiday. pornographic noise and power electronics from D9/Tea with Satan drummer and Dirk Diggler vocalist translating their grindcore aesthetics into something way more twisted and brooding. TaaPet) supported by Remesh members. sax player Dirar Kalash joins vocalist Rani Zager (Lietterschpich/Grave in the Sky/Poochlatz/Special Olympics) for a freefall-freejazz-noise harassment. guitar wall of noise from Dukatalons’ Zafrir Tzori – everything that is LOUD from drone to post rock and black metal. deviant industrial and morbid power electronics from Jizzbox and Remesh members. CDs and vinyls from the following labels and distros will be available for sale for very low prices: Heart&Crossbone, Topeth Prophet, Urban Decay and Alamut. All this will occur on Saturday night, October 3rd at the FAQ Cafe on the 4th floor of the Ravnitzki 7 building in Tel-Aviv. Starts at 20:00, entrance is only 30 NIS.